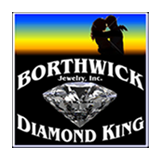 Planning to buy a diamond then we at Borthwick Jewelry, Inc. understand its importance and our guide below will make your diamond buying a more easy and enjoyable experience. Most important criteria that a jeweler uses while grading a diamond are Cut, Clarity, Color and Carat weight. It's commonly known as 4 C's of a diamond. All this four properties will determine how much a diamond is worth. VVS1-VVS2 - Very, Very Slight Inclusions: Have very small inclusions. It"s very difficult to detect inclusions under 10 x magnifications even by a trained gemologist. VVS1 inclusions can only be seen through the pavilion. VVS2 inclusions are more visible.